In the last part of this series, basic processing steps and calculations of useful DTI volume maps has been described. This part focuses on tensor visualization and fiber tracking as implemented in BrainVoyager QX 1.9. Tensor visualization and fiber tracking can be performed if a DDT file is available, which is itself derived from a corresponding VDW data set containing the original diffusion data in 3D space (original scanning space, AC-PC space or Talairach space). 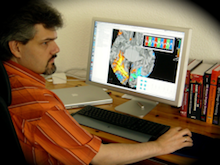 Analyzing fMRI data using a powerful Graphical User Interface (GUI) allows to easily specify different analysis steps such as motion correction, slice timing correction, spatial and temporal filtering, normalization and statistical routines. For a specific experiment, one usually wants to preprocess and analyze the functional data of all subjects in the same way.